Bob was an average-looking collie puppy in every way, except for his bobbed tail . . . and maybe that's why the Brazier family named him Bob, or Bobbie. But he was average in no other way. In 1923, Bobbie joined Frank and Elizabeth Brazier for a cross-country drive from Silverton, Oregon, to Indiana, Frank's home state, where they planned to visit family. During a stop in Indiana, Bobbie was chased off by loose dogs, and after a week of searching and placing newspaper ads, the broken-hearted Braziers had to give up and start the drive home. Six months to the day after he was lost in Indiana, a very thin Bobbie was spotted on a Silverton sidewalk, his coat matted, his paws raw from wear. Unbelievable as it seemed, the three-year-old dog had WALKED almost 2,800 miles to get back home. Though weak and tired, Bobbie went berserk with joy when he was reunited with his family, and from that day, all of their lives changed. In the weeks and months that followed, his story tore across the country in newspapers and even in a hardcover collection of pet stories. He was the main attraction at an Oregon home-builders convention in Portland, where thousands lined up to pet him, and he starred in a short feature film. Also, the Braziers eventually heard from people along Bobbie's homeward-bound route, places where he'd stopped long enough to recoup, and then he was gone again. These stories verified their thinking. Bobbie had done the impossible. When Bobbie died, he was buried in Portland, Oregon, by the Oregon Humane Society. Rin Tin-Tin was there to lay a wreath at his funeral, which was officiated by the mayor of Portland. 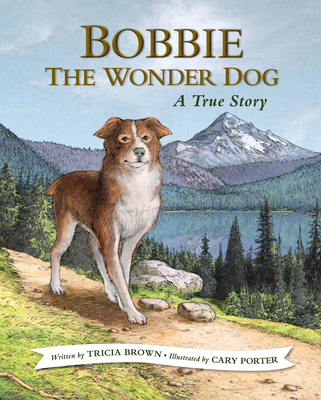 This incredible story is all true, and the origins of Lassie Come Home are said to be traced to the story of Bob of Silverton, also known as Bobbie, the Wonder Dog, a Scotch collie mix. Tricia Brown is an author, editor, and book developer. She travels often and is a popular speaker in schools, libraries, and events in Alaska as well as the Lower 48. Her multimedia presentations, which include lessons on Alaska natural history and culture, regularly receive high praise from educators and parents. She loves to get kids excited about reading, writing, and art. www.triciabrownbooks.com Cary Porter is a fine artist living in Portland, Oregon, where he grew up. His painting style reflects his love for the deep forest and the fairy tales that they naturally inspire. While painting is Cary's primary focus, illustration has been a large part of his life and career, working with a variety of clients on a wide range of projects. He realizes a great deal of satisfaction and joy from bringing to life the visions of others through collaboration.